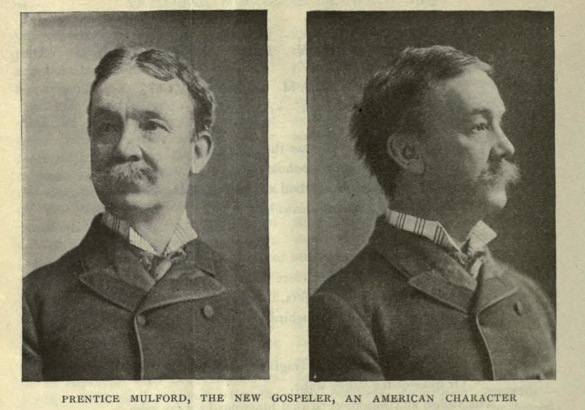 Prentice Mulford was a popular literary humorist and California author. He was a contemporary of Mark Twain and Bret Harte who wrote for Harte's "Overland Monthly" as well as The Golden Era, the Californian, and other San Francisco publications in the 1860s. By the 1870s, he traveled to Europe, sending back funny stories to American newspapers, then lived for 17 years as a hermit in the swamps of Passaic, New Jersey. While there, he continued to write humor for Lippincot's Monthly, Punch, and an assortment of New York publications. Meanwhile he began writing of spiritual matters and wrote six books that became the cornerstone of the liberal "New Thought" movement. Those books are still available and the movement is very much alive and active today. Unfortunately, too much of Mulford's great humorous writing has vanished from view. We will present his funny stories from time to time, as we can find them. "In the spiritual life every person is his or her own discoverer, and you need not grieve if your discoveries are not believed in by others. It is your business to push on, find more and increase your own individual happiness."